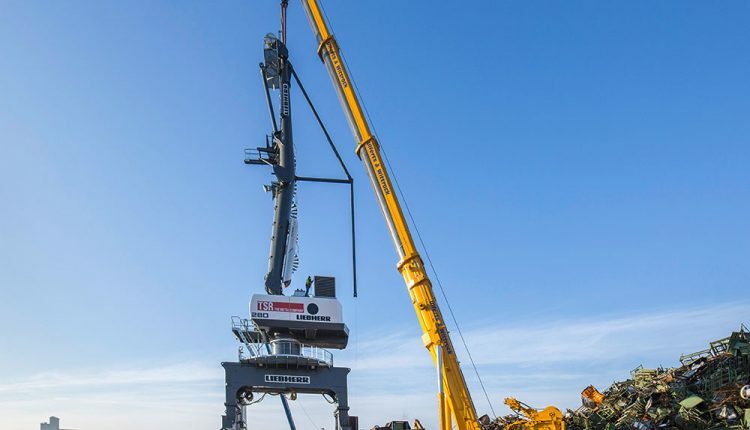 Liebherr LPS series portal slewing cranes are handling machines with a small footprint and are therefore mainly used where space is at a premium. But this then makes the assembly of the machines, which weigh hundreds of tonnes, an even bigger challenge. Crane and heavy haulage contractor Ulferts & Wittrock based in northern Germany, was asked to assemble a Liebherr LPS 280 portal slewing crane with a maximum lifting capacity of 84 tonnes for handling scrap metal at Bremen’s industrial port, a job which involved hoisting heavy loads in a highly constricted area. Heiko Ramke, from the External Technical Service Team for Large Cranes at Ulferts & Wittrock, who handled the control levers of the LTM 1500-8.1 himself for some of the time, explained the situation on site. “The size of the area available meant that it was not initially possible to assemble the portal slewing crane on the rails. Initially the travel gear supports were assembled with the cross carriers and this total load of 115 tonnes was then moved around 2.5 metres by three cranes, the 500-tonne LTM 1500-8.1 and two 200-tonne machines and hoisted onto the travel gear which had already been placed on the rails.” Two weeks later the portal crane’s boom was assembled by a tandem hoist by a 130-tonne and a 160-tonne mobile crane. The Group has a total of over 150 mobile cranes with lifting capacities of up to 800 t, six lattice boom cranes with lifting capacities of up to 750 t and eight mobile construction cranes. The company has been trading since 1909 in Bremen when they started to provide furniture transport services and carry out small haulage work with a horse and cart.